(subsidiary of QANTAS Airways) (IM/AAU) (Sydney) 1991 - 1996. Photos. Framable Color Prints and Posters. Digital Sharp Images. Aviation Gifts. Slide Shows. 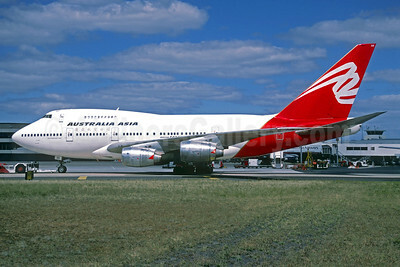 Australia Asia Airlines (QANTAS Airways) Boeing 747SP-38 VH-EAA (msn 22495) SYD (Jacques Guillem Collection). Image: 932035.